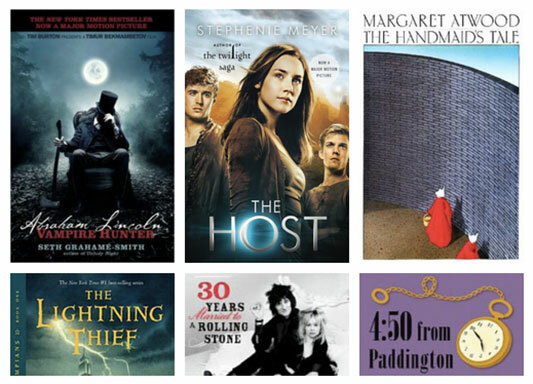 $2 eBook Deal: The Handmaid’s Tale, The Lightning Thief, The Host & more! Today’s Gold Box Deal spotlight deal of the day over at Amazon today is a sale on select Kindle ebooks for $2.99 or less, in honor of the company’s two-year anniversary of Kindle Daily Deals. Note – this deal is valid only for today, Saturday, August 24, 2013, until 11:59pm PST. Visit the main sale page to see all of today’s Kindle ebook deals. You can also browse the many titles on sale for $3.99 or less in the Monthly Deals, including the F. Scott Fitzgerald short story collection Tales of the Jazz Age (which contains The Curious Case Of Benjamin Button) for $.99 and It’s Only Rock ‘n’ Roll: Thirty Years Married to a Rolling Stone by Jo Wood (wife of Stones guitarist Ron Wood) for $2.99. This year, The Rolling Stones set a milestone as they celebrated their 50th anniversary. 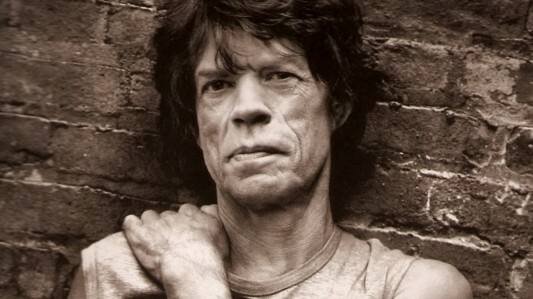 Now, another milestone gets set as it’s charismatic front man Mick Jagger celebrates his 70th birthday today. Forty years ago, if you asked anyone, probably the band included, if the Stones, let alone Jagger, would still be performing in 2013, most people would have shook their collective heads in disbelief. In 1973, to imagine having not only that staying power, but the wherewithal and organic propensity to even WANT to continue playing rock and roll in what seems like an unofficial young man’s game, would have been scoffed at. But it’s precisely and exactly that which has happened, and from the looks of the success of the tour that just recently had a stint at London’s famed Hyde Park, in front of 65,000 plus adoring fans, there seems to be no sign of letting up. 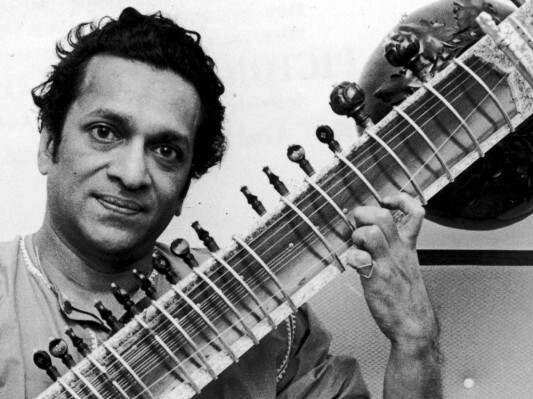 Ravi Shankar, who in essence almost singlehandedly brought Eastern “raga” music to the American shores and wound up influencing scores of famous musicians and bands, The Rolling Stones and The Beatles to name two, passed away in San Diego, CA, on December 11, 2012, reports The New York Times. He was 92. Shankar had suffered from heart ailments and underwent heart valve replacement surgery it was reported in a statement released by Shankar’s family. Excelling on the sitar, an eclectic string instrument in which neighboring strings on the neck in essence resonate when a melody string is played, gave off a sound that was instantaneously connected with Shankar’s style and musical language. Shankar played like an extension of his personality, soft spoken, well mannered, respectful, yet with an attitude and a verve almost akin to a Jimi Hendrix. Up until the mid 1980s, when CDs started to become the musical norm in how one listened to their music proper, records were the norm of the people; not just a communally popular way to hear songs, but it became a giant subculture of the fabric of life, a hobby, a key element in creating parties, in creating gatherings and get-togethers, a source of fun competition in who would have more records than whom and who would have the rare cool records, in essence, vinyl hoarding was a collector’s and layman’s dream for decades upon decades. With its outer cardboard casings known as “sleeves,” bands and musicians of all musical genres were able to express themselves not only in the music they created, but by the art that was presented on the front and back covers, which spawned an entire new artistic medium in a sense. 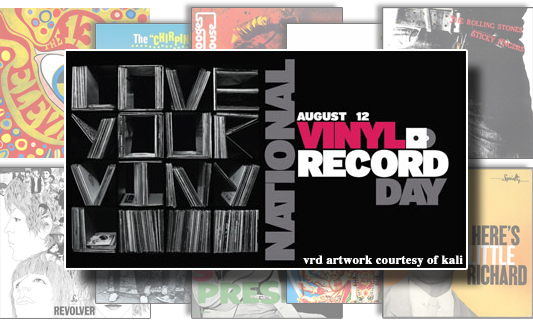 In a way, every day should still be a Vinyl Record Day in some regard, and as the way music is bought and downloaded these days, in binary coded “bitted and byted” digital forms, not only has the way of the vinyl passed in essence, but also all the visual accoutrements that came with it. It has become a relic of the past like a rotary telephone or a CB radio, a dinosaur’s regime, which ultimately is hence even a more urgent reason to preserve the memory and image of the record alive in the 21st century. 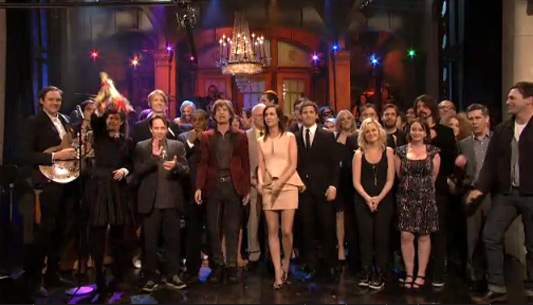 Last night’s Saturday Night Live apparently marked Kristen Wiig‘s final episode as a regular cast member, and with a little help from host Mick Jagger, the comedian got an emotional, musical send-off from her fellow cast members and SNL producer Lorne Michaels. The last skit of the episode showed the Rolling Stones frontman speaking at a high school graduation, where he calls up Wiig for a special farewell, congratulating her after “7 years.” As the Stones tune “She’s A Rainbow” begins to play, Wiig takes off her cap and gown, and her cast members one-by-one take the stage to dance with her. With the help of one of the musical guests, Arcade Fire, the cast and guests all sing “Ruby Tuesday,” with Wiig teary-eyed as people like former cast member Amy Poehler and her Bridesmaids co-star Mad Men‘s Jon Hamm came on stage. You can watch the farewell here below. Coming hot on the heels of the 40th anniversary of one of rock and roll’s all time greatest records, The Rolling Stones’ Exile on Main Street, is the news that a dramatic movie highlighting the making of the record is at the inception of production for the silver screen. 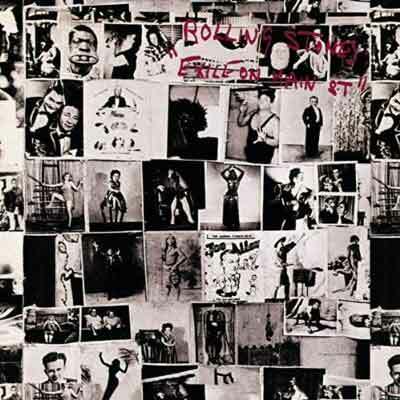 The Playlist reports this week that Virgin Produced Productions, headed by mogul Richard Branson, has acquired the rights to Robert Greenfield’s concise tome Exile on Main Street: A Season in Hell with the Rolling Stones and plans to make a feature film about the making of this seminal record, with all of the drama and wild tales of rock and roll excess that went with that making of the 2-album set. 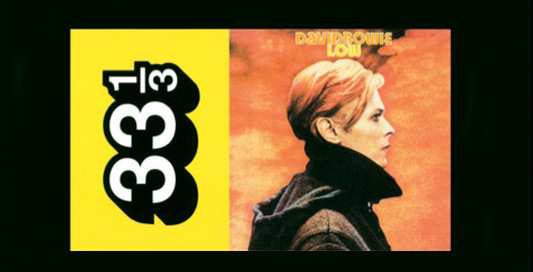 The Kindle ebook deal of the day over at Amazon today is 10 titles in the 33 1/3 book series that focuses on specific albums from artists like David Bowie, Public Enemy, The Beastie Boys, Bob Dylan, The Kinks, The Rolling Stones, and more for just $.99 each. 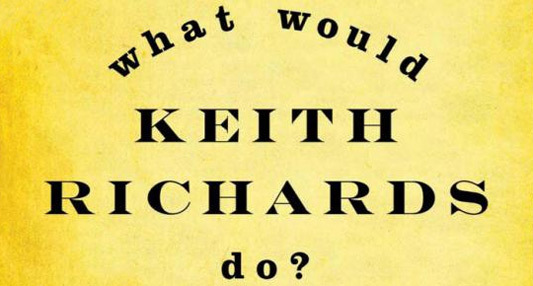 $2 eBook Deal: What Would Keith Richards Do? As part of Amazon’s monthly deal of 100 Kindle ebooks for $3.99 or less, What Would Keith Richards Do? : Daily Affirmations from a Rock and Roll Survivor is on sale for only $1.99 (that’s down from the original digital list price of $11.99). If you’d like a physical copy of What Would Keith Richards Do?, the hardcover is available for the bargain price of $6.40. 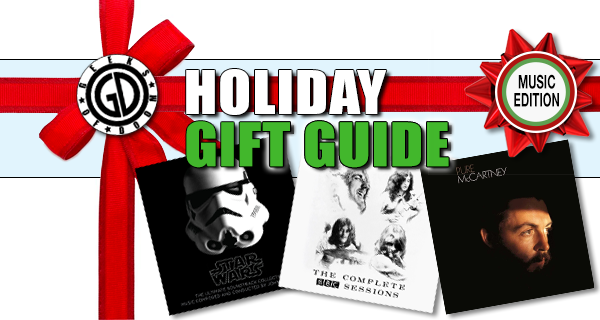 As with all bargain books, quantities are limited.